We've now arrived at the hottest part of the year in North Texas - the Dallas Cowboys have opened their training camp (in relatively cool Oxnard, California) and the fall football season is again on the horizon. The Club has been busy though, and we have a full schedule of events for the next several months. Read on for the Club’s news for August, and the latest updates on our upcoming events. Today will be the third 100-degree day this year - two below normal for this date (and no I am not going to tell you what day I am writing this. I am a procrastinator and do things at the last minute). But, I will not have time in the next couple of days so I have a quiet slice of time as my wife has my 3-year-old granddaughter occupied. We were gone last week and this week we (mostly I) have had just our 3-year-old. Next week we (again, mostly I) have the two grandsons, a 4-year-old and 5-year-old. I missed the Convention in Tulsa so I will let Lane tell you all about that. Next year’s convention is in Atlanta and I will be working with our friends, Dan and Dave, from Rolling Stock Hobbies. So, mark your calendar for June 4th through June 9th for the 34th Annual Convention. By the time you get this we will have met at Kim and Steve Lazzari’s home. 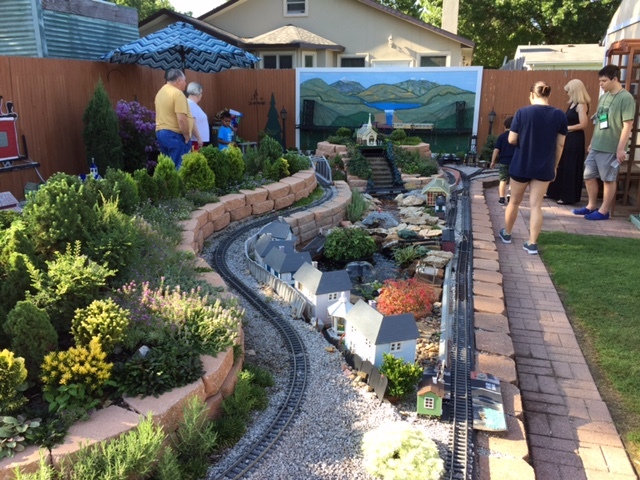 He has a great outdoor layout and Kim is well known for her culinary arts with recipes from days gone by on the rails. 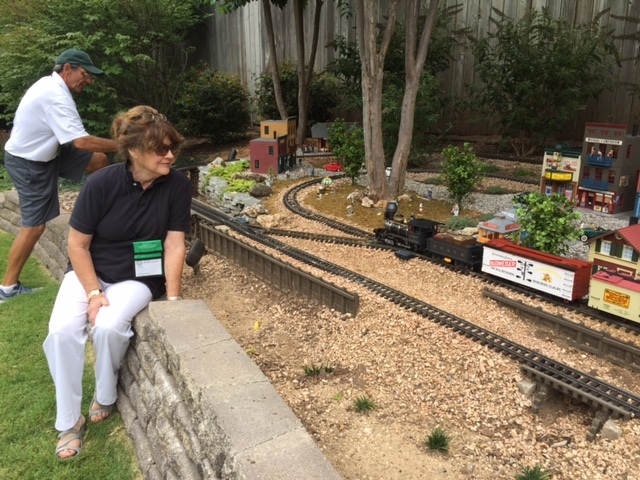 She puts together her favorites from many of the railroads past and present. Not much else to report at this time from my President’s Car. 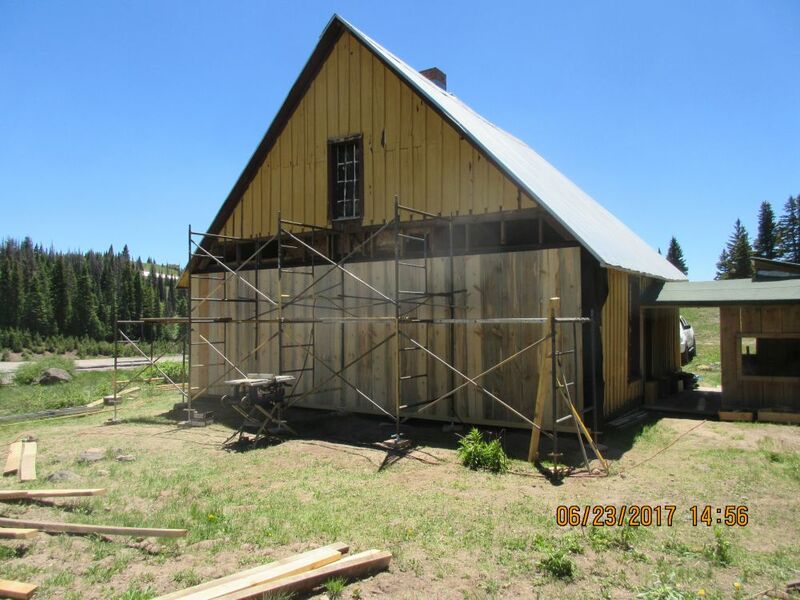 Last but not least though, thanks to Pete Dahlberg for his two weeks of volunteer work on the Inspector’s house for the Cumbres Toltec Railroad. (FYI, it is the longest coal fired steam locomotive train in the United States and it is owned by two states, the States of New Mexico and Colorado.) 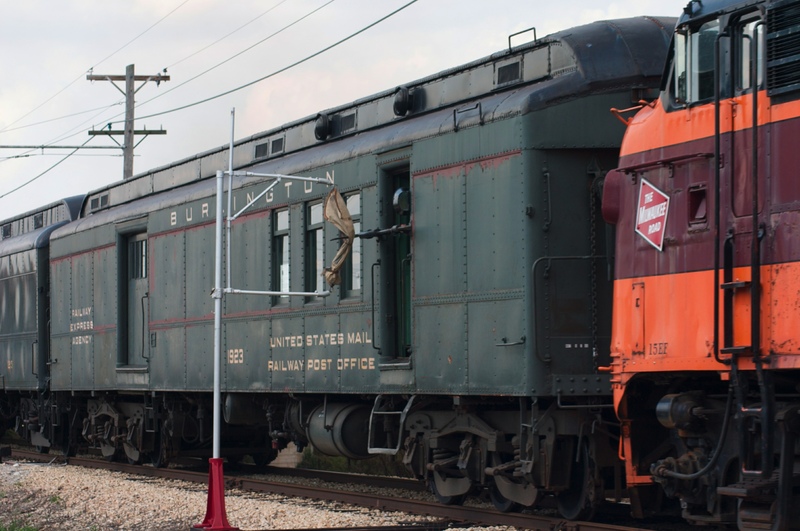 It was part of the D&RGW railroad when the two states purchased it. He did not get enough, so he is returning for two more weeks to finish the Inspector’s House and complete the project. Reminder: Your 2017 Dues are still only $25.00 for this year AND a Life-Time Membership is still only $250.00. Those Life-Time memberships make a wonderful gift. There are still a few members that have not renewed from 2016. August 8th Cook’s Children’s Hospital 8:30 AM to 4:00 PM. Get your name to Lane Haviland ASAP so it can go on the security list. (There is free parking for this event). September 2nd & 3rd (set-up on the 1st, 1:00 PM). Clark Gardens. September 30th Fall Plano Show, set up about 1:00 PM on the 29th. There will be a set-up workers’ no host dinner at the Bavarian Grill following the setup. Just finished another great home meeting at Steve and Kim Lazzari’s Garden RR. 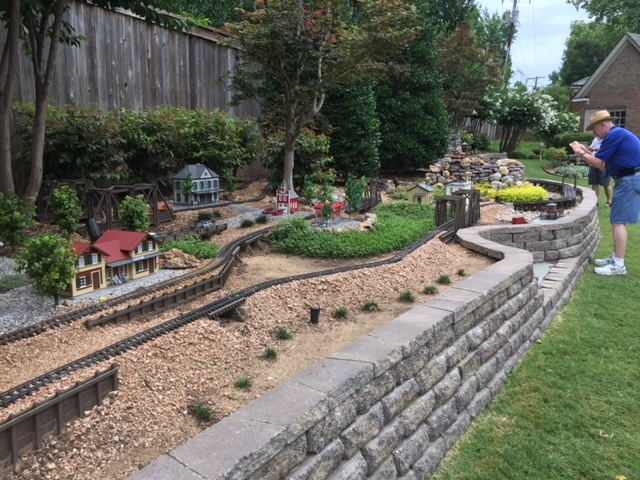 This has got to be one of the best garden layouts in the DFW area. 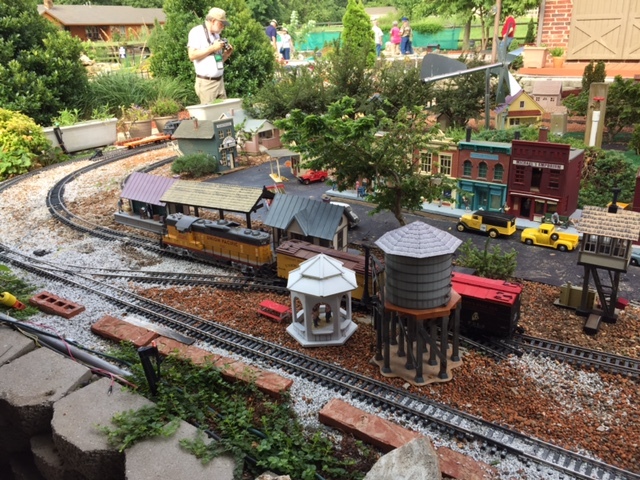 They had it all running with numerous long trains and all under the shade trees---yea! Hard to top that RR but Kim may have done it with her pulled pork and bean dinner. She is our Top Chef and did not let us down. Not sure of the member count but probably close to 25 attended including some new members. 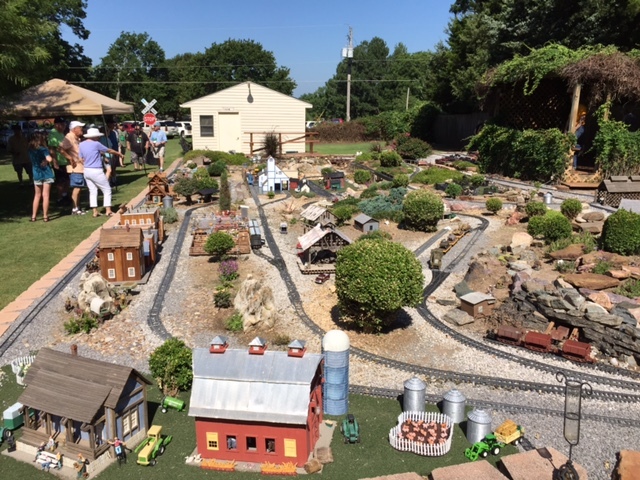 Last month was the National Garden RR Convention, hosted by the Tulsa Model RR club. I think six of our members were in attendance including Brenda and myself. The highlights were the tours taking place all around Tulsa, eastern Oklahoma, and Oklahoma City. Lots of clinics each day and then dinners and BBQ’s at night. 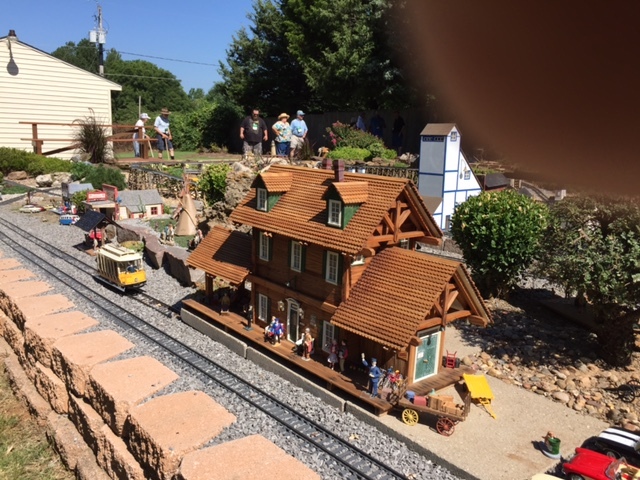 Below are just a few of some of the great layouts at the event. Remember, on Tuesday, August 8, we are back to Cook Children’s Hospital for a one-day show. Please be there by 8:30 AM for set up. We will tear down at 4:00. The Club’s events calendar for the remainder of 2017 and the schedule to date for 2018 is below. Note that in 2018, the months of July and October are still open. Please let me know if you are interested in hosting a meeting and we will get you on the schedule. 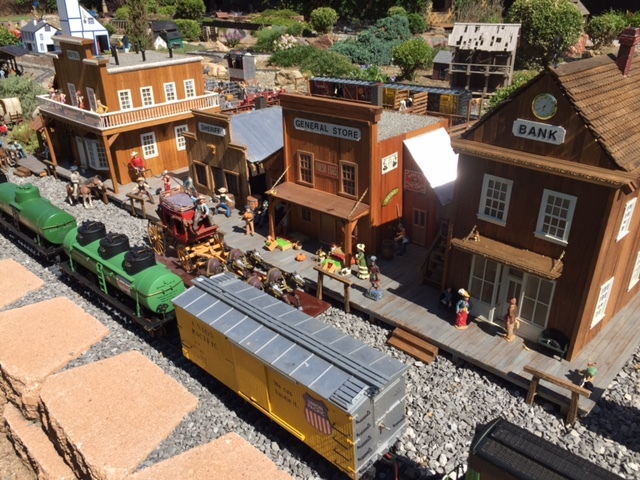 JANUARY 20th & 21st (setup 1PM on the 19th) PLANO ANNUAL WINTER TRAIN SHOW. Q: What did you do on your summer vacation? A: As many of you may know, I am a member of the Friends of the Cumbres & Toltec Scenic Railroad (www.cumbrestoltec.org) which provides volunteer labor and funding for keeping the non-mechanical parts of the C&TSRR operating. 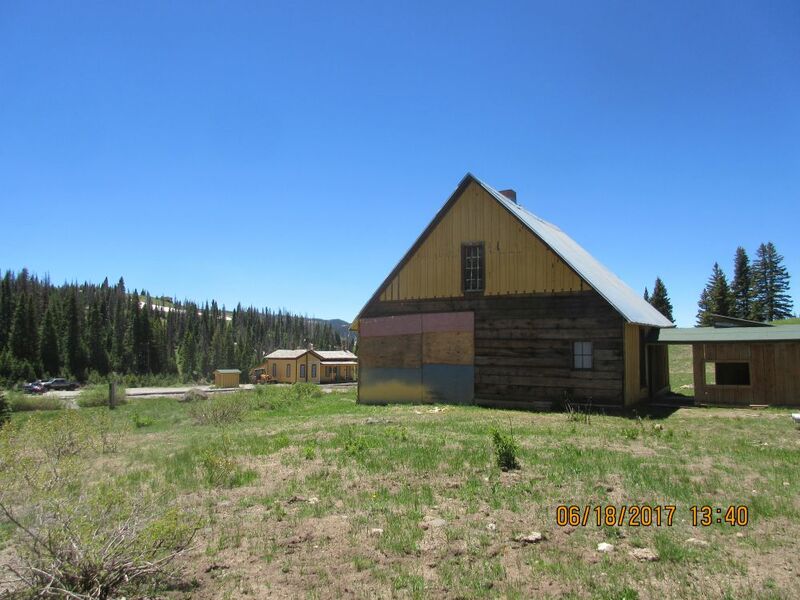 This year I signed up to continue the work on two buildings (the Car Inspector’s House and the Section House) on Cumbres Pass. 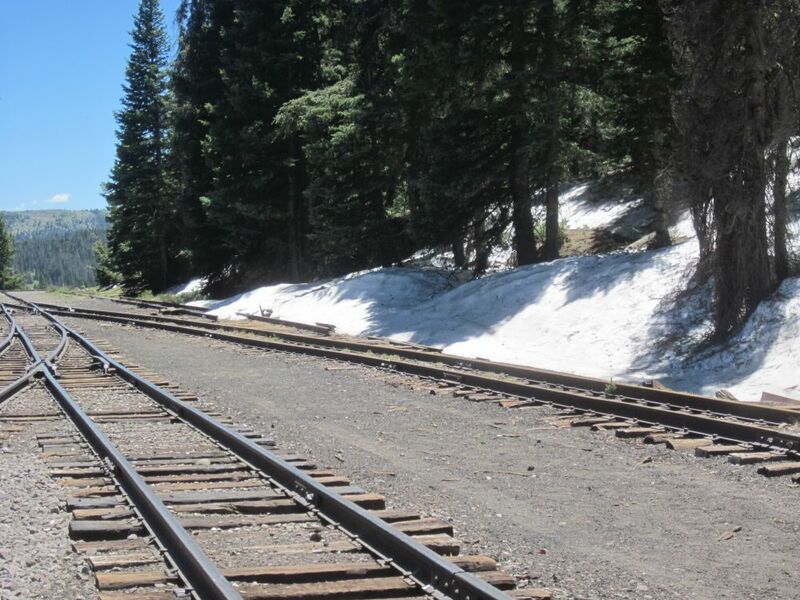 This past winter the Pass had approximately 20 feet of snowfall so it was at first questionable whether we would be able to start work the last two weeks of June. Picture taken 6/18/2017. Still plenty of drifted snow on the ground at the Pass. 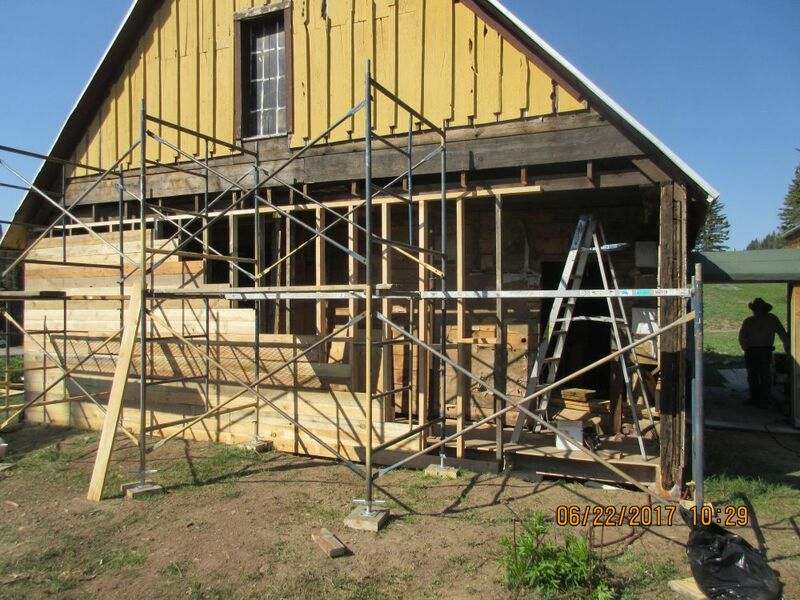 However, due to some warmer weather the first 2 weeks of June, we were able to get into the site. The downside of the warmer weather was that there was a bumper crop of mosquitoes for the entire two weeks of work sessions. Section House in background, Car Inspector’s House foreground. 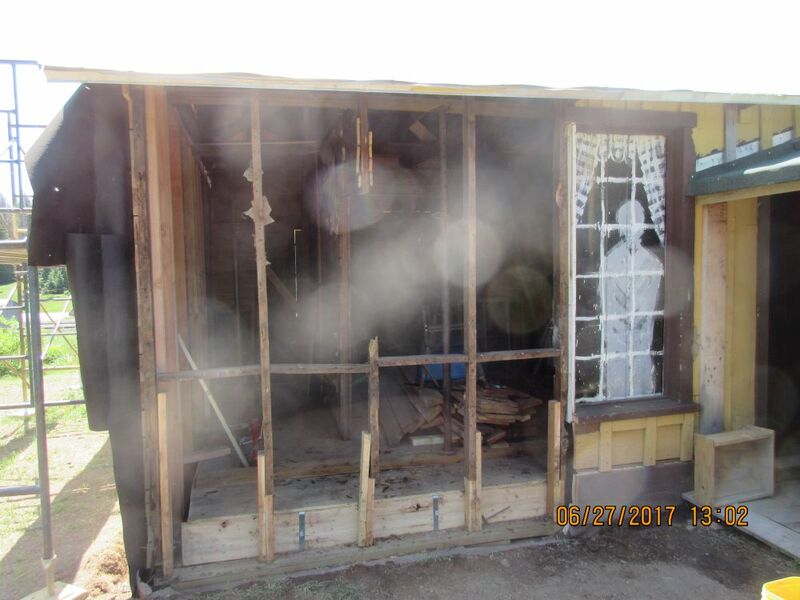 Background: In 2013, the Friends examined the Car Inspector’s house and determined that: the roof structure was not sound and would need to be rebuilt; the walls of the house were not sound and were not plumb (vertical) nor level. It was determined in 2013 that the walls should be rebuilt before the roof structure could be rebuilt. Subsequently two of the four walls have been rebuilt. Our job this year was to continue the replacement of the walls of the Car Inspector’s House. The replacement involved installing jacks to support the second floor, removing the siding, removing existing wall studs, building new wall studs, leveling and plumbing the studs, applying sheathing to the studs, applying roofing felt to the sheathing, and finally applying siding to the rebuilt wall. Old siding removed showing paper “insulation”. Note that the lower portion of the wall studs are “sistered” because original studs have rotted away. Left side has new studs in place. Right side has jacks supporting the second floor joists. New wall studs are being prepared. Sheathing is being applied to the new studs. Sheathing is staggered to provide “shear” strength to the wall. Note: there originally was a window on the right side. 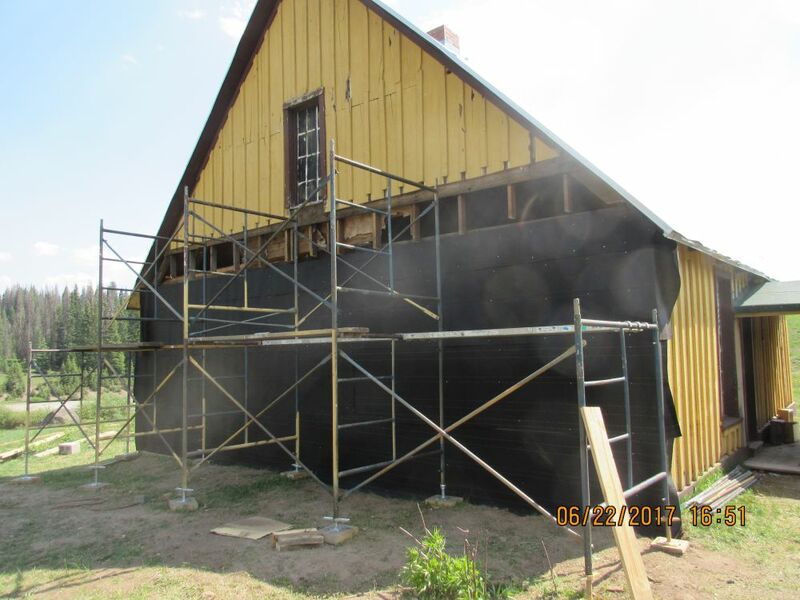 The studs have been installed to accommodate the original window which is being rebuilt in the wood shop in Chama. It will be installed when the rebuild is completed. Sheathing is fully installed and has been covered with roofing felt. The purpose of the felt is to reduce airflow through the siding and to keep insulation which will be installed in the stud work dry. Siding has been installed. It will be painted at the end of the season to protect against the winter weather. Open area above the siding will be temporarily covered until the roof structure is rebuilt. Fourth wall with siding removed. Note “sistered” studs and broken stud in the middle. 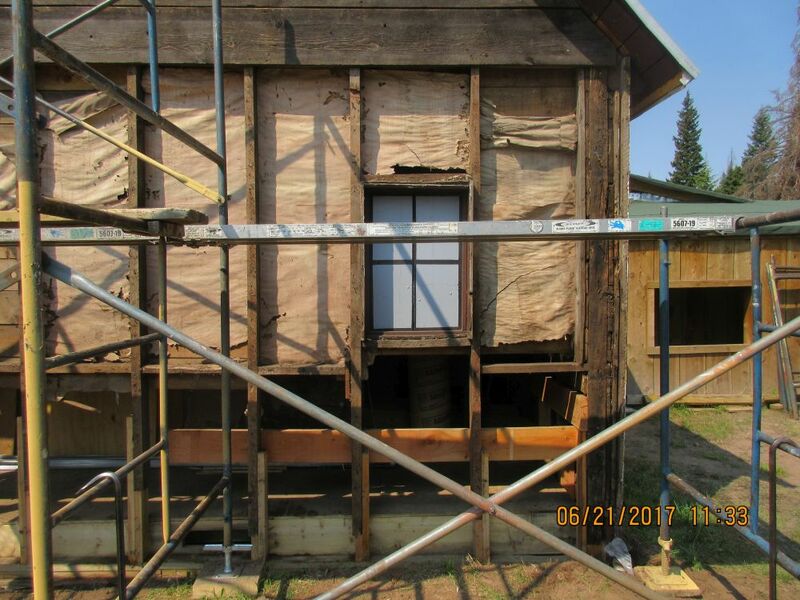 This wall section had new studs, sheathing and siding installed by the end of Session D.
Looking forward: The remaining portion of the fourth wall should be rebuilt by the end of the 2017 work sessions with windows rebuilt and installed. While rebuilding the walls, it was discovered that the floor which was rebuilt about 10 years ago was improperly installed and not historically accurate (important since these are now National Historic sites). Additionally, there are load bearing walls built upon the floor as well as the chimney. Current plans are to remove the chimney at the end of the 2017 work sessions to aid in the rebuilding of the historically accurate floor. The next steps will be to rebuild the floor, then rebuild the load bearing internal walls, then rebuild the chimney and finally to rebuild the roof structure. This will probably take several years of work sessions. 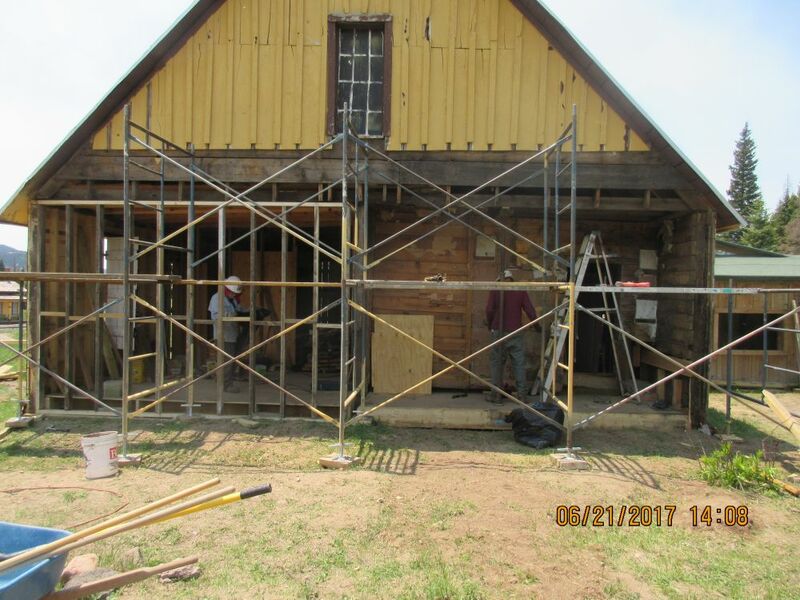 Once the structural rebuilding is complete there is the intention to finish the interior so that it will represent what the house would have looked like in 1890s. 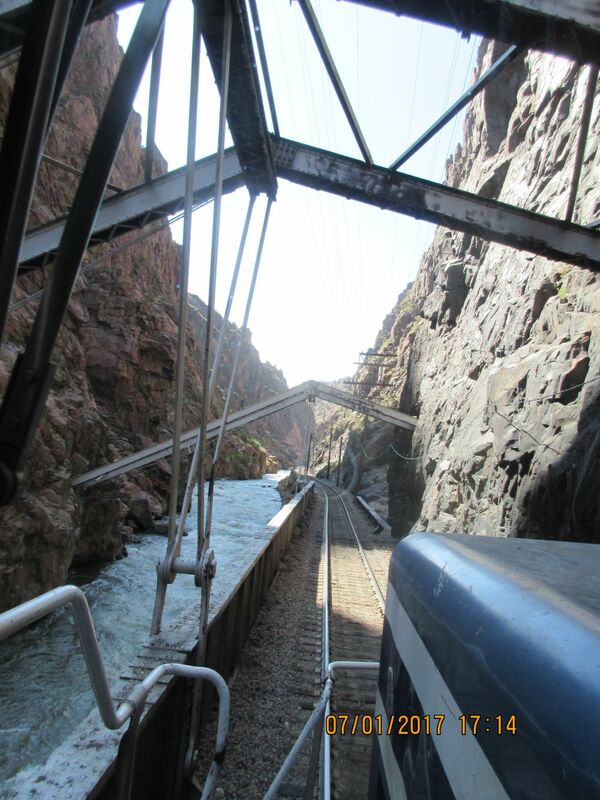 On my way home from C&TSRR I detoured to ride the Royal Gorge RR which was also originally part of the D&RGW narrow gauge. This line was converted to Standard Gauge when it was determined that it was more efficient to run standard gauge trains. The RGR is currently running refurbished CN streamlined passenger cars pulled by GP38-2 diesels. 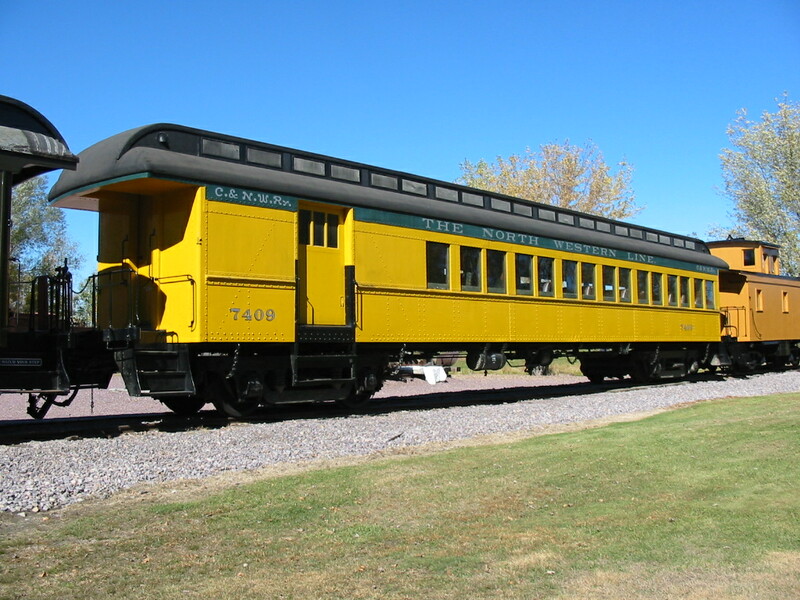 Depending on the passenger load the train will contain multiple dome cars, several open gondolas and several regular coaches. 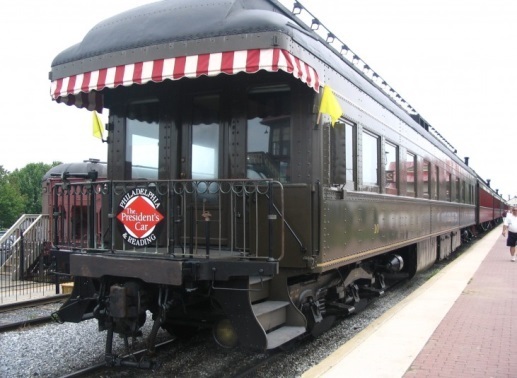 Although the ride is relatively short (11 miles one-way) they will serve freshly cooked meals if you desire. 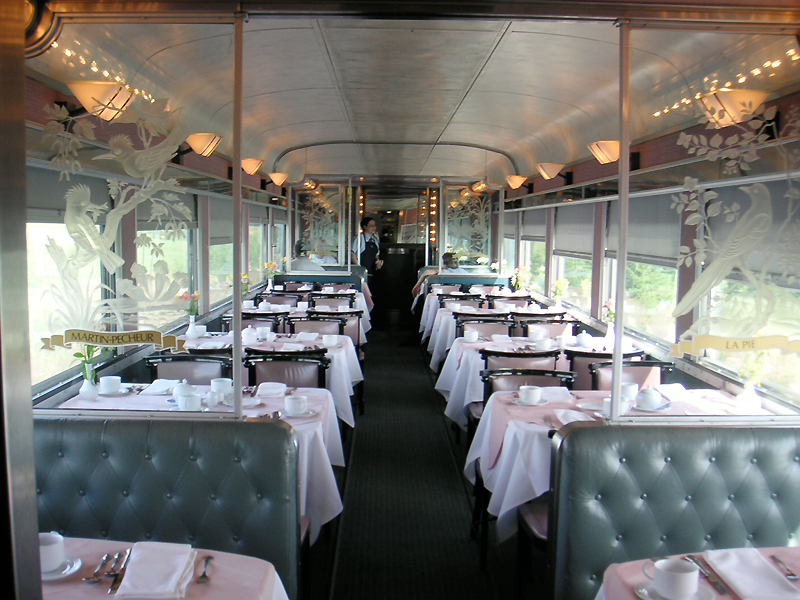 For an extra fee, it is possible to have a cab ride one way on the trip (other part if the trip is in a dome car). The engineer I rode with was quite friendly and knowledgeable about the route. 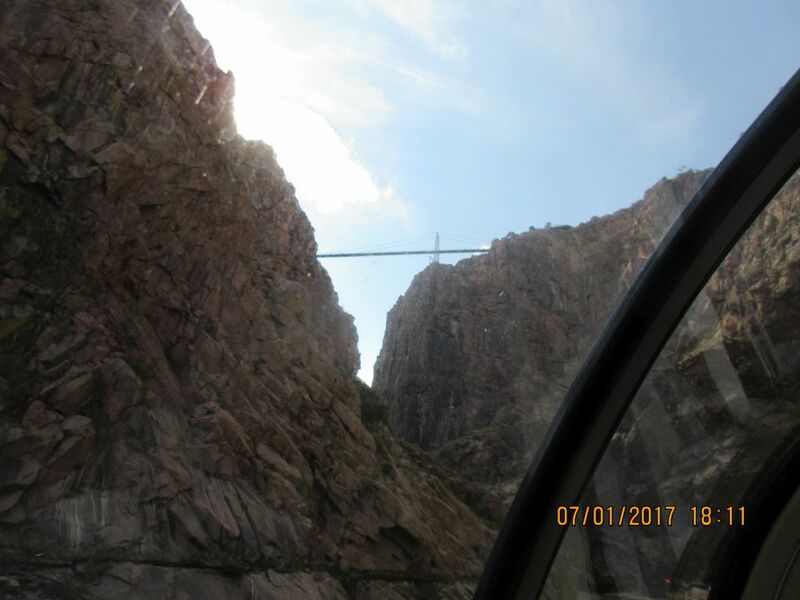 Two notable items on the ride are the Hanging Bridge and the Royal Gorge suspension bridge. The Hanging Bridge was the solution the RRs engineers came up with to install a bridge where there was not enough room to install normal bridge supports. The Suspension Bridge is noteworthy since it is over 1000 feet above the river. Hanging bridge – water running underneath roadbed. So wonderful to see everyone at July's club meeting! New faces and seasoned ones, blessed to have you all to our home. I had told Ron I would not be writing an article this month due to all that was going on in our schedule, but I would like to share a couple of recipes I used last weekend. Hope you all enjoyed, it was my pleasure to cook for you again. Dump everything in a crock pot, simmer on low all day until mixture becomes thick. Can cover with lid if you like more liquid. If you're lucky enough to have leftovers, boys use it as bean dip for their tortilla chips! Best made using fresh veggies, but in a pinch can substitute ready-made refrigerated salsa. Mix first 2 ingredients in large bowl. Mix rest of ingredients together into a dressing and pour over cabbage. Stir to coat, refrigerate. Mix together dry ingredients, set aside. In mixer, combine wet ingredients, then add dry until smooth. Pour into prepared 13x9 cake pan. Bake at 375⁰ for 25-40 minutes, use toothpick to check doneness. Sprinkle with powdered sugar or cover with ganache. Ganache: Heat 1 cup heavy cream in a double boiler, then add 2 cups chocolate chips. Let melt and whisk until smooth. Thanks for reading our August Newsletter. I hope to see many of our members at Cook Children's Hospital in Fort Worth next Tuesday, August 8th. 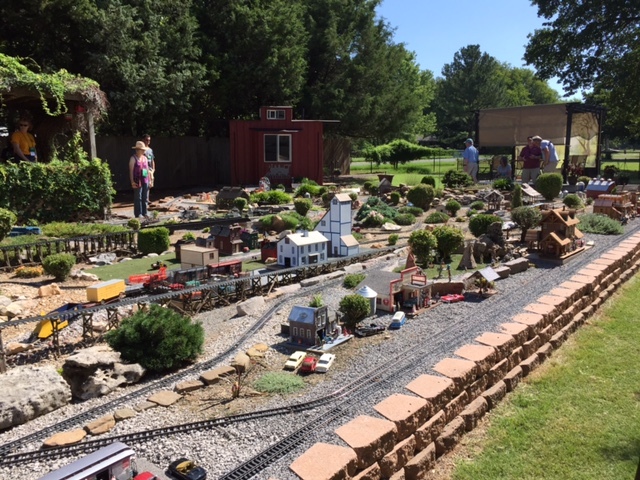 Remember to check out our North Texas Garden Railroad Club (NTGRC) group page on Facebook, in addition to our established website: http://www.ntgrc.org, where, if you click on the “Events Calendar” link on the left side, you can find details on all our scheduled events for the remainder of 2017, as well as those we have firm dates for in 2018. Also check out the "Want Ads" section, where there are several new listings of items that have been donated to the club that members can buy at discounted prices.